"Easily download your favorite videos from YouTube"
Who doesn't watch a YouTube video regularly? Most of us do, and chances are often you'd like to be able to download that particular video easily. Or what is more, maybe you would like to download an entire channel or a playlist, so you can watch those videos at any time convenient to you on any of your preferred devices, whether on your mobile device on the road or on a device linked to your media center, for instance. Direct YouTube Downloader is the tool to check out, as it will let you download an entire YouTube channel, a playlist or user's videos, including the Ultra HD 4K, 1080p and 720p versions. 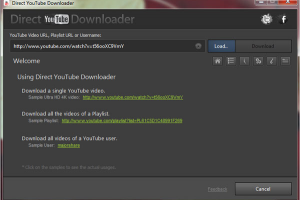 Direct YouTube Downloader is very easy to use and completely free. With this program you can not only download files as WebM, MP4, 3GP, FLV, MP3 or AAC, you can even convert the videos to mobile phone and tablet formats directly.